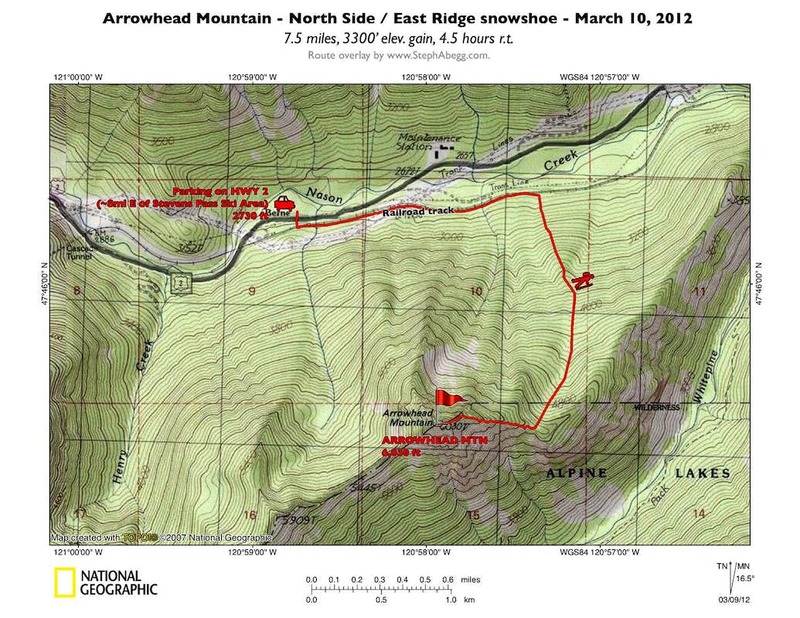 Good route for a day with high avy danger. 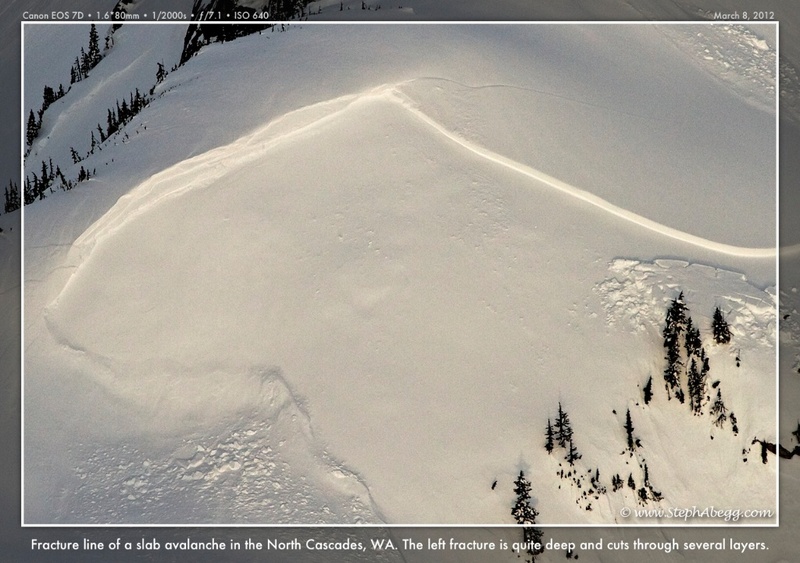 Late winter and spring usually bring episodes of high avalanche danger to the North Cascades. This week had been one of those times. 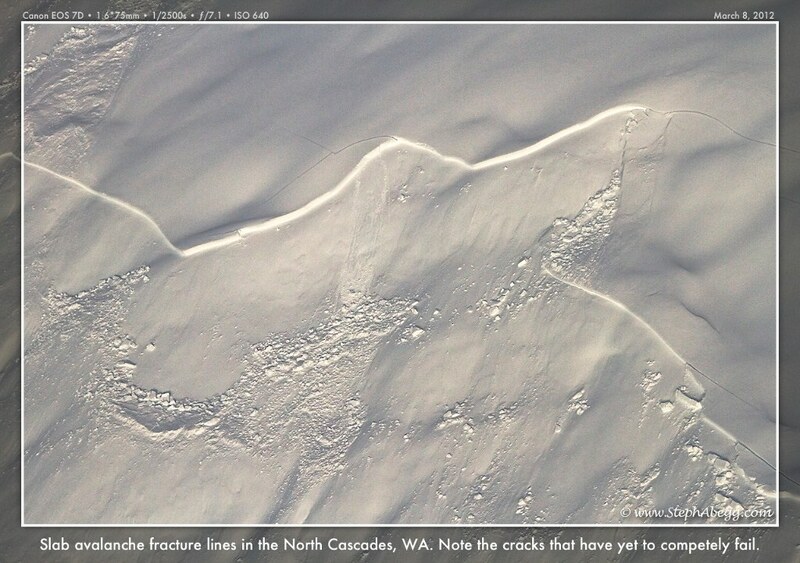 On Thursday, during a flight with aerial photographer John Scurlock, we had photographed a couple of impressive fracture lines from recent slab avalanches in NCNP (Slab Fracture 1; Slab Fracture 2), and I was reminded of the need to be wary this time of year. Needless to say, it was a good weekend to head for the trees. 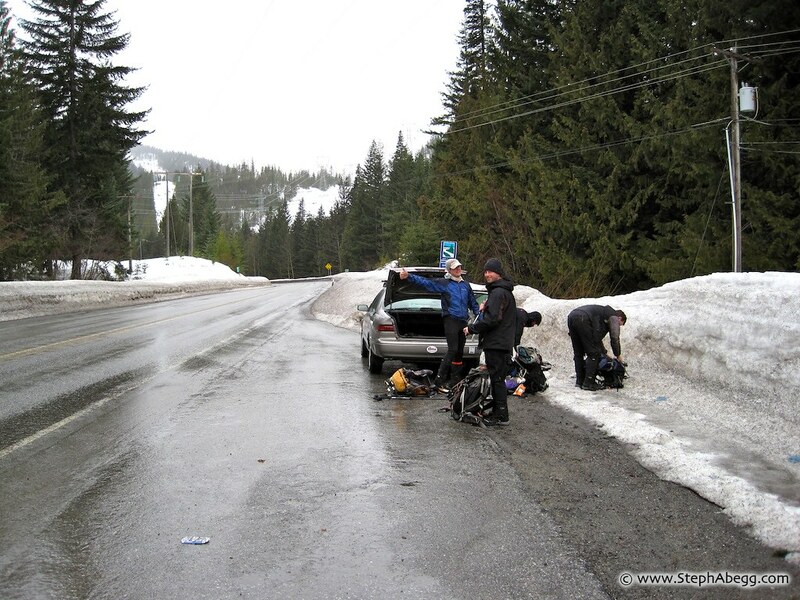 Arrowhead Mountain (on HWY 2 just 8 miles east of Steven's Pass ski area) seemed like a good choice. Being mostly timbered slopes, it is usually safe even when there are high or considerable avalanche conditions elsewhere nearby. We parked at a small plowed pull-out on the north side of HWY 2, 0.3 miles east of the railroad overpass. From there we crossed the highway and got on the railroad tracks, heading eastward. (One might wonder why people who do this route don't park further east along HWY 2 in order to avoid the railroad track walk that parallels the highway; I think the main reason is a lack of parking on the plowed highway to the east.) 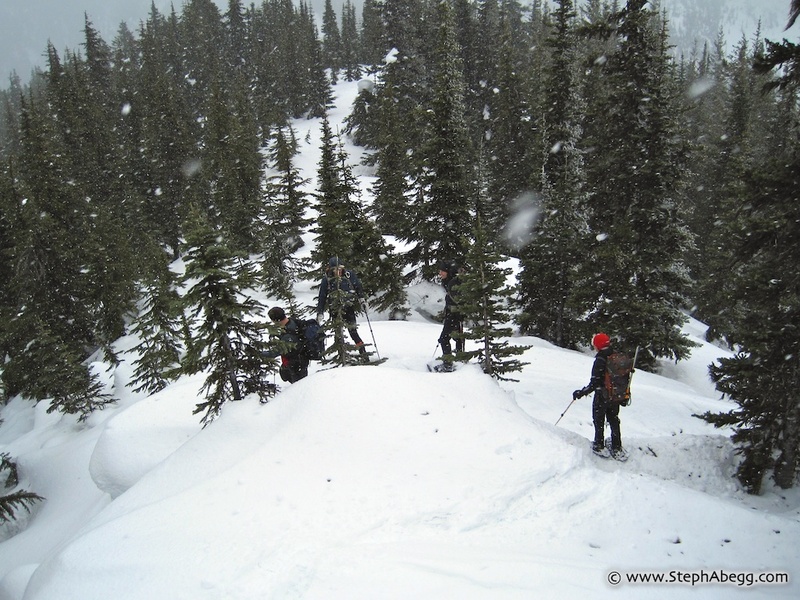 After about 1.2 miles, we strapped on snowshoes and headed straight uphill, hitting the east ridge at ~5100' and swinging westward toward the summit. The snow was the kind that is good for building snowmen rather than the deep wading stuff, so it made for fairly easy travel. We arrived at the summit only 2 hours and 33 minutes after we left the car. Apparently the views are excellent. Monte Cristo peaks, Sloan, Glacier, Rock, Howard, and Mastiff to the north. The Chiwaukums to the east, The Cradle, Daniel, Hinman, and Jim Hill to the south. 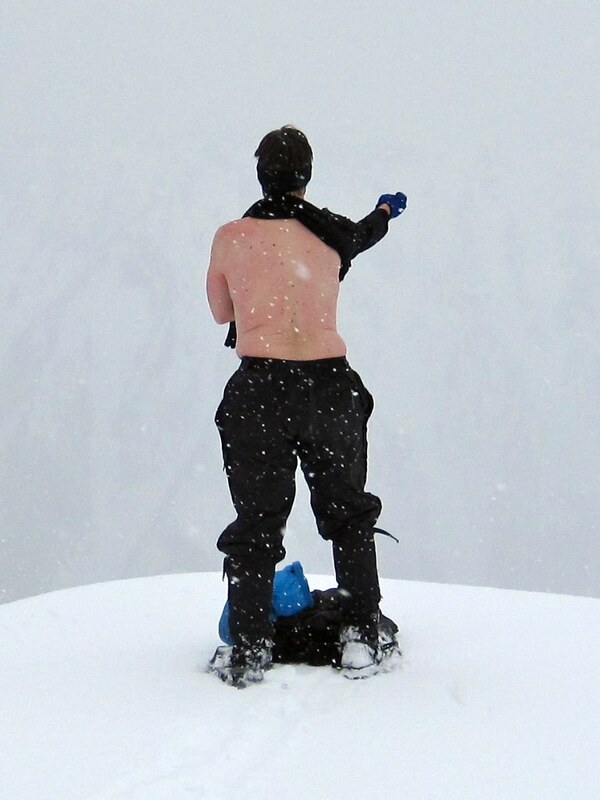 After enjoying the non-existent views and doing some skipole-snowball batting practice, we headed back down to the car. It was a quick and easy 1 h 43 minutes. A fun day, but too short. A day in the mountains with friends is never long enough. Steph, You came to the right place for railroad info. Lengths of rail...like all things steel, are flexible. Rail comes in quarter mile "sticks" that are welded up in a special plant. Closest for BNSF is in Laurel MT. Loaded on trains with several miles of rails and hauled to the site where its unloaded. More machines place the rail. Perhaps you noted that the ties at that spot are concrete and the rails are held in place with spring clips. Welding of the sticks is done in the field using Thermite (iron powder and aluminum powder I think..without looking it up). All field welds are ground smooth, inspected and the rail is initialed by the welder. Rails wear with use so big machines are used to grind the railhead to very specific profiles. For reduced friction there should be only one tiny spot on the center line of the rail where the wheel rides. This is all engineering stuff so you might not like to look at it =). 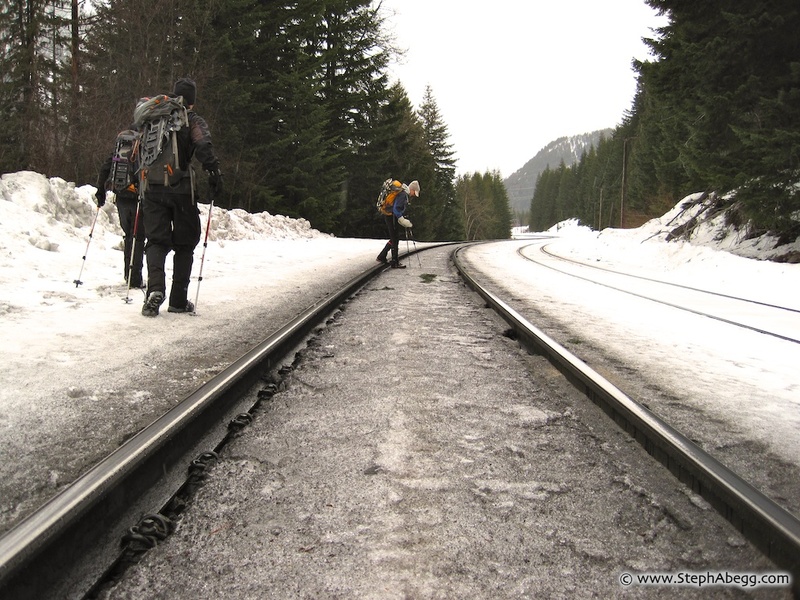 Now intrigued and resigning myself to the fact that there might indeed be some interesting things about engineering, I asked Roger if the rails at Steven's Pass were the originals laid down by the Great Northern Railway between 1890-1900. Likely the rails are not original. Because rails have been upgraded for heavier trains and because of use. Rails on curves take quite a beating on the inside of the curve where the train leans into the rail so they have to be replaced every few years. Head Hardening helps that. Sometimes the outer rail is replaced with the inner rail as the worn side is then outside. Other than curves it depends on tonnage over the rails as to how often they would be replaced. So rail that’s replaced on Stevens Pass would still be good for a lot of other places. Maybe it would go to the railroad to Sumas, for example, where that rail might need to be upgraded and there are still a lot of branch lines and sidings that have jointed rail waiting for some nice used welded rail. A couple of things you might not have noticed. There is a clamp on the bottom of the rail. That’s there to anchor the rail from sliding downhill. The clamp comes against the tie and thousands of them help resist the downward slip. And..the manufacture date it was made and other info is located every so often along the side of the rail. 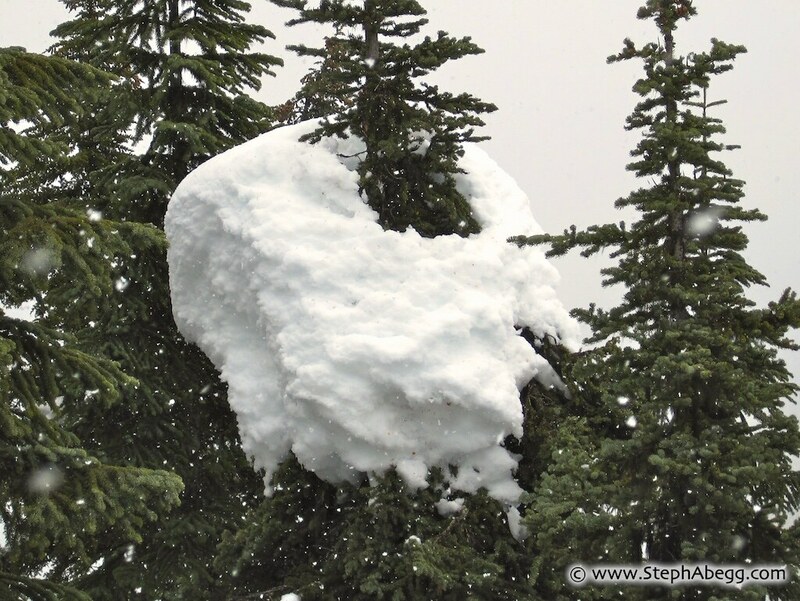 Another interesting thing about Stevens Pass. The tunnel is the limiting factor on how many trains there are. Its an 8 mile long tunnel, I think it takes a train about 20 minutes to traverse and then the tunnel has to be ventilated for about 30 minutes before the next train can pass. There is a door on the east end that is closed when a train is in the tunnel and large fans force air to the west end. I hope you find railroad history “fun”. Thanks Roger! Who knew you could turn a boring stretch of hiking into a fascinating history lesson! Due to the "Chance of precipitation 70%. New snow accumulation of 1 to 3 inches possible" weather forecast, I just took along a point and shoot camera. It takes photos decent enough to document the day, and isn't as much of a liability as my SLR. Photos below. Parking along the north side of HWY 2. Hiking along the railroad tracks for the first 1.2 miles. Watch out for trains! 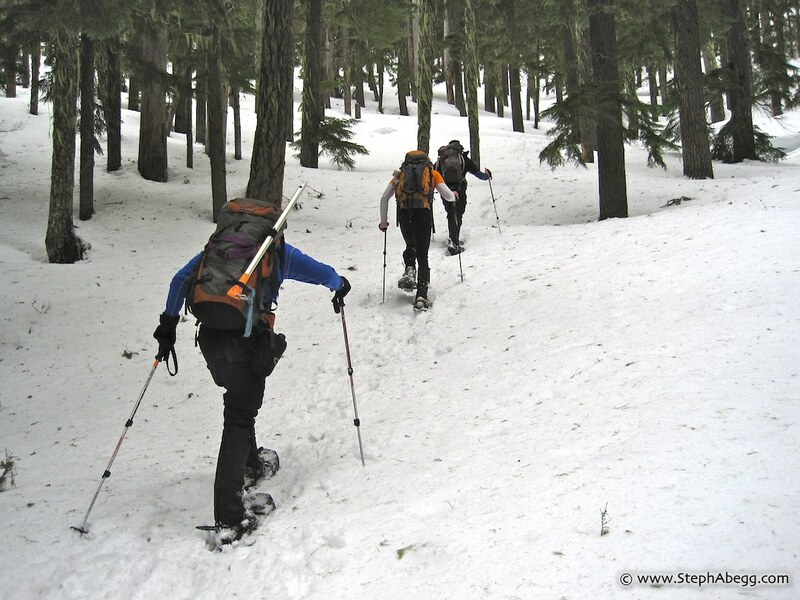 Snowshoeing up timbered snowy north slopes of Arrowhead Mountain. 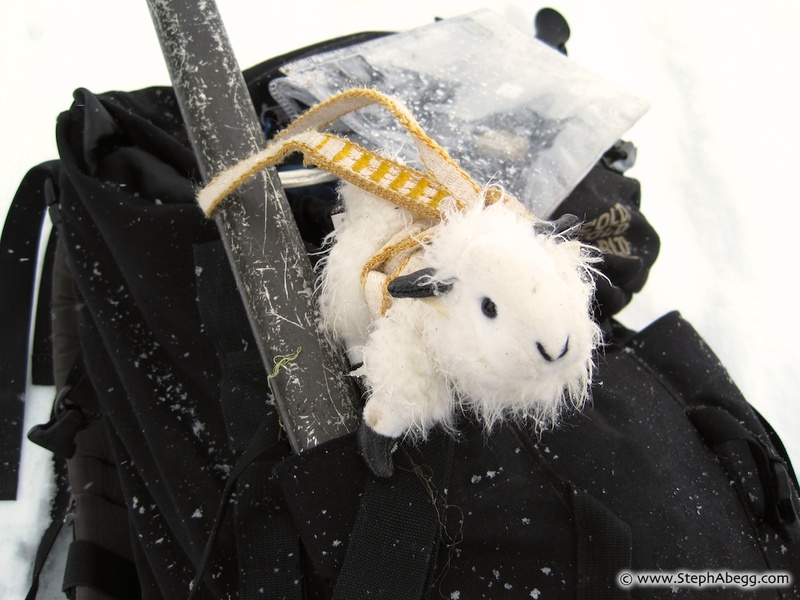 On the summit. Apparently the views are quite good. Billy came along for the day. Why/how this hefty snow ring stayed put while all other trees are bare is one of life's great mysteries. 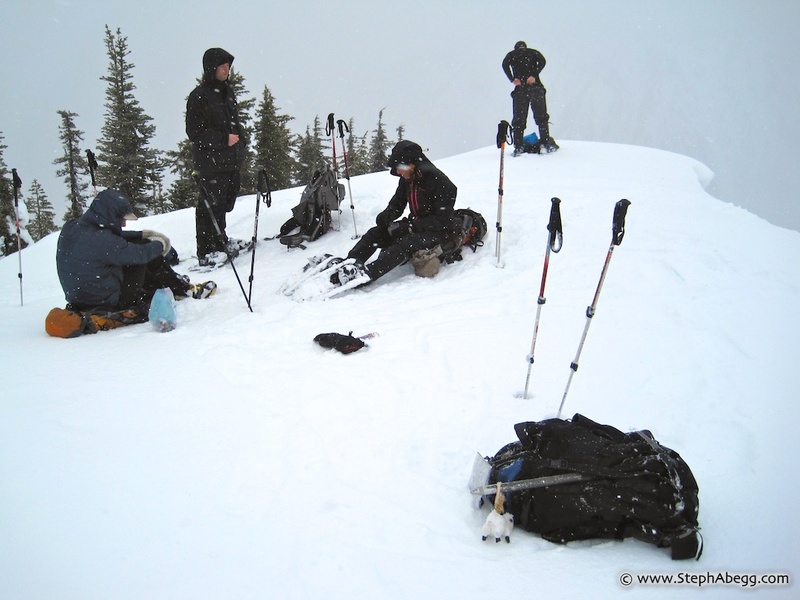 Descending the timbered east ridge of Arrowhead Mountain.